George Graham Reviews Judith Owen's "Lost and Found"
The chanteuse has certainly made a comeback in recent times. The vaguely romantic, sultry, or cabaret-influenced female vocalist has been turning up on quite a lot of recordings lately. It seems that most of the jazz releases coming out these days of are by female vocalists. The rock and pop scene has also seen quite a few, most notably Norah Jones, and going back to kd lang, and other emerging performers like Madeleine Peyroux, and Belle du Berry of Paris Combo. There are also some jazz singers who have made eclectic chanteuse recordings such as Patricia Barber, Cassandra Wilson and Grazyna Auguscik. This week we have yet another recording by a chanteuse, and it's one of the most intriguing and distinctive since Ms. Barber's Verse back in 2002. It's by Judith Owen, and it's called Lost and Found. Judith Owen has a fascinating story. A native of Wales, she was born into a musical family. In fact her father was a professional opera singer. Ms. Owen says as a child that she literally waited in the wings of the stage for her father to finish a performance. Ms. Owen credits his wide-ranging tastes for her musical eclecticism. Her mother died while Ms. Owen was still in her teens, and she took up songwriting as a way to assuage her sense of loss. She looked to some of the jazz singers as models, but was a songwriter from the start. She moved to the US in the late 1990s, settling in Southern California, and marrying actor and satirist Harry Shearer, known for his work on Public Radio's "Le Show" and for his role in the satirical film Spinal Tap. Ms. Owen soon released a CD called Emotions on a Postcard in 1999, and has been performing mainly on the West Coast and releasing independent CDs since. Her music has also been used in various films, and perhaps thanks to her husband, she became an animated character in The Simpsons TV show, playing a jazzy Celt. She has also found fans among other performers who have asked her to tour with them, including Richard Thompson, who brought her into his "1000 Years of Popular Music" stage performance. She also toured with and opened for kd lang. Lost and Found is Ms. Owen's' fifth release, and she describes it as "the album I've longed to make." It is indeed a gem, with Ms. Owen creating some fine songs, both musically and lyrically, and performing them in a setting that ranges from just her piano, to larger groups with guests like Keb' Mo, Richard Thompson, and Cassandra Wilson. She also does some fascinating covers of popular songs from Cole Porter to heavy metal pioneers Deep Purple. Her style is quite distinctive. While she often performs in a jazzy setting of acoustic piano and bass, her songs are more in the rock singer-songwriter mode. Vocally she can recall mid-period Joni Mitchell, though with a definite British accent, and she can also be a near perfect torch singer, though with a bit of a rock edge. Her CD was recorded in New Orleans, Los Angeles and Seattle, and has as her regular group Sean Hurley, who generally plays a big jazzy acoustic bass, plus drummer Jimmy Branley. But many tracks lack drums altogether. Her husband Harry Shearer also appears on a couple of tracks on electric bass and backing vocals. Ms. Owen is a worthy pianist, providing excellent and often imaginative accompaniment to the songs. 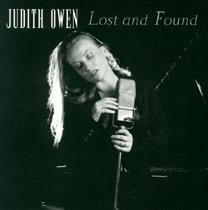 Los Angeles based, Welsh native Judith Owen, on her new CD Lost and Found has established herself as one of the best of the new generation of chanteuses, with her stylistically difficult to pin-down, but outstanding and memorable vocals, first-rate songwriting and excellent musicianship. The CD, with its generally understated, acoustic accompaniment, nevertheless draws on echoes of rock and the more electric singer-songwriters. And her covers of songs from Tin Pan Alley to more contemporary rock are brimming with imagination. Sonically, we'll give the CD an unqualified grade "A." The recording quality is outstanding, despite the variety of venues for the sessions. Ms. Owen' voice is beautifully recorded, capturing a lot of her subtlety, and the acoustic bass is also especially well handled. The dynamic range of the recording is quite commendable, with the span from soft to loud maintained, something that has become very rare in these days of massively compressed, hyper-loud CDs. With a background almost as interesting as her music, increasing public visibility, and a downright superb new album, Judith Owen could become the next great 21st Century chanteuse.